There’s no denying the cuteness factor of bunnies. It’s no surprise really that these wonderful, amusing, fascinating creatures are Britain’s 3rd most popular pet. However what a rabbit needs is often misunderstood. This lack of knowledge results in their needs not being met, and our adorable fluffy friends suffer neglect, loneliness and stress. Pet bunnies have much the same needs as wild bunnies; space, grass, companionship, grass, shelter, grass, safety from predators and more grass! Bunnies are most active at dusk and dawn and require substantially more space than just a hutch. A hutch if used should only be a bedroom and your rabbit needs constant access to a larger exercise area where they can hop, dig and running around. They also need some ‘furniture’ they can hide in and jump on and ideally some tunnels to play in and out of. These items don’t need to be expensive, cardboard boxes with a hole at each end make great tunnels; as do sections of (clean!) sewage piping. Obviously any rabbit enclosure needs to be safe from predators and also prevent any bunny escape tunnels! You could edge the enclosure with paving slabs, create a wire mesh skirt or there are specialist anti-dig kits available. Bunnies also make great house pets; they’re easy to litter train but still need as much space to exercise and play in as outdoor bunnies. Make sure to bunny proof each room before opening it up for exploration; beware of electric wires, poisonous plants, other pets and opportunities for bunnies to escape! In the wild bunnies spend most of the day eating grass and not always great quality grass. Grass is an essential part of the diet because the long fibre strands are important for good gut health. Rabbit’s teeth grow continually and so chewing grass or hay is also important to keep the teeth worn and prevent then becoming misshapen. For your domestic bunny hay should make up 85% of the diet and ‘rabbit food’ such as pellets or extruded pellets only 5%. Rabbits can be quite selective in their feeding so try to avoid muesli mixes as this allows them to only eat their favourite parts! The other 10% can be fresh vegetables like broccoli and occasionally a bit of fruit, but just like us too much sugar should be avoided! You can judge how good your rabbit’s diet is by looking at its poo! On a good diet poo should be large pea sized firm pellets of compressed hay like material; soft sticky dark small poo is a sign of poor gut health. At night time rabbits produce a special sort of very soft faeces called a caecotroph; this is partially digested food matter which they eat straight from their bottom and then digest it a second time! Their wild counterparts live in groups and bunnies are naturally very sociable animals. This companionship is so important that it has been shown in studies that a bunny will seek company even over food. Bearing this in mind it’s important than pet bunnies are kept in pairs, or indeed compatible groups. As well as providing company, living with other bunnies provides warmth and mutual grooming. It is also recommended that you neuter your bunny. Neutering will prevent breeding, create more harmonious relationships, reduce aggression and makes your bunny easier to litter train. In the UK we vaccinate bunnies against myxomatosis and RHD1&2 (Viral haemorrhagic disease). 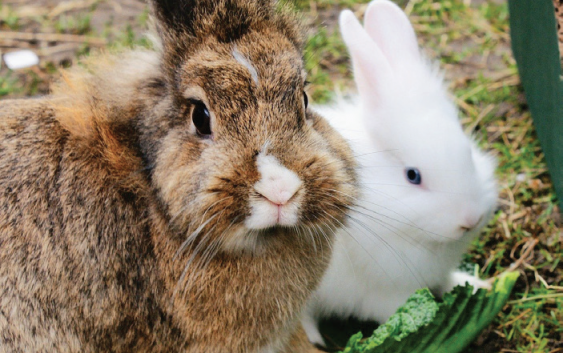 While myxomatosis is transmitted by fleas, mosquitoes and very close rabbit contact, RHD1&2 can be passed by direct rabbit to rabbit contact or be excreted and then persist in the environment for a very long time. None of these diseases can be treated but all three can be vaccinated against, speak to your vet for more details.